As a teacher, I have experienced the “ADHD Explosion”. The term has come to be accepted and acquired by any child that has trouble fitting into an educational setting that is not developmentally appropriate for a spontaneous, energetic child. ADHD is over-diagnosed, as well as simply used as a term by lay people to describe any child that has difficulty sitting in a chair in school all day and focusing. 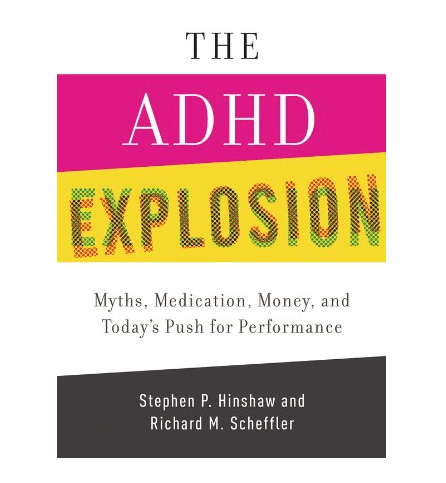 [amazon_link id=”0199790558″ target=”_blank” ]The ADHD Explosion: Myths, Medication, Money, and Today’s Push for Performance[/amazon_link] by Stephen P. Hinshaw and Richard M. Scheffler is a science-based book that explains this epidemic where one in nine children in the US receive the ADHD diagnosis and 70% receive medication. Myths about ADHD persist. Too many people continue to believe it’s a cop out, an unvalidated condition related to society’s penchant for overmedicalizing defiance or a convenient label intended to cover over social problems. These myths destroy any hope of providing systematic educational, behavioral, and medical care for the youth, families, and adults who desperately need help. Medications are still viewed suspiciously for behavioral and psychiatric conditions, a position unfortunately fostered by the ease of getting an ADHD diagnosis and securing pills for performance enhancement in too many quarters of society – and by overreliance on medication as the only treatment worth pursuing. To deal with ADHD better than we do now, we must alter our attitudes as well as our educational and healthcare practices (Hinshaw & Scheffler, p. 168). Some people contend that the main cause of ADHD is food additives and dyes or excessive sugar in the diet. First, sugar is not the cause of hyperactivity or ADHD, even though many kids with this condition may gravitate toward sugar-rich food. Second, food additives, although not the primary cause either, have recently been shown to contribute to small amounts of hyperactive behavior in at least some youth, rekindling debates that started with the Feingold diet of 40 years ago. In addition, early exposure to pesticides or flame-retardant chemicals may increase risk for both ADHD and autism-spectrum disorders. Complicating matters is that genetic vulnerability to ADHD may be triggered by such toxic exposures. On other words, certain individuals are potentially more susceptible than others to toxic factors in the environment ( Hinshaw & Scheffler, p. 29). Once again, our toxic world combined with our genetic history, not forgetting epigenetics, is causing neurological issues in our children. I am also against medicating children in most circumstances. I believe changes to the environment can help many children with difficulties function more efficiently. I think this book is essential reading for any family or school dealing with ADHD.